Looking back just a little. 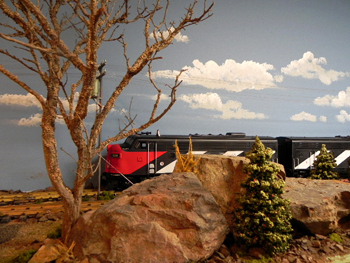 I hope I’m forgiven for doing nothing newsworthy on the layout since finishing off the scenery in the corner. 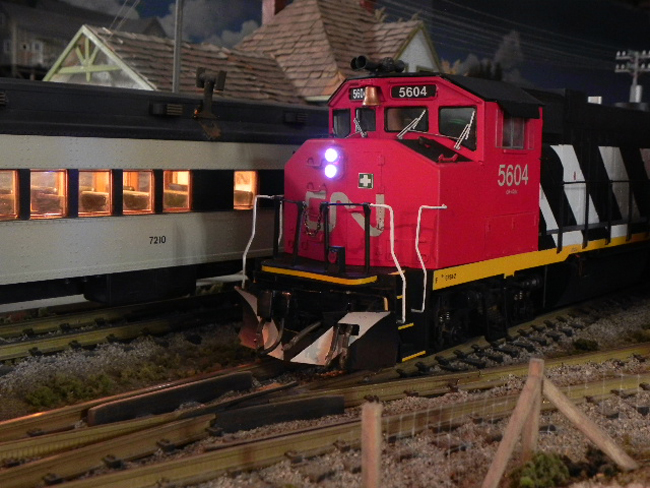 http://wvrr.ca.htm All of my efforts have been dedicated to installing AirWire and Phoenix in the motive power, rebuilding a USAT extended vision caboose and chopping the nose on a Hudson Terminals GP9. Both of the latter projects are coming along fine and a photo story is being developed for both. In the meantime I’d like to look back on some things I think are important and that may have been lost somewhere in the archives. You probably know my feeling about the model railway industry figures available from Aristo, Life Like and the rest. Just how many clowns, ugly brides and fat policemen do we need on our layouts anyway? The best variety, and most costly of course, is offered by Preiser. They have demonic figures too but the selection is superior. See…..
And don’t forget the model car builders. Their stuff is excellent. I have also seen a few questions pop up on various forums regarding paved roads. Colour, width, height etc. So I did a little looking into this myself. 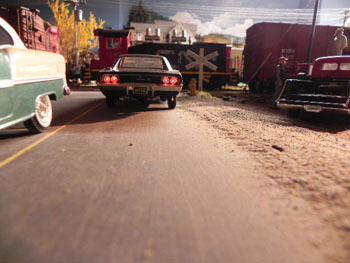 It was important to me because so much of my layout area is taken up my streets and highways. No more than a smaller scale in general but in 1/29 much more ‘real’ space is allocated. I found this….”The minimum width of the pavement of major streets shall be sixty-four (64) feet; of secondary streets, forty (40) feet; and of minor streets, thirty-four (34) feet; all measured between the faces of curbs.” It’s a US standard but I followed it pretty closely using ‘secondary streets’ as my Canadian prairie town maximum. No curbs of course. Colour causes much debate. Trust me though. Asphalt isn’t black. At least not after a few weeks in the weather – and how many of us model a freshly paved street? I tried a few samples (about 1 square foot) of silver-gray-rust outside in the sun – on the street – viewed from about 20 feet away – and came up with a colour mix that blended in just fine. No hints here. You’ll have to check it out and be happy with your own. The rural roadways in my own prototype town are raised about 18 inches above the rough ditch on either side. This is for runoff on a desert mountain street of course so you might see yours differently – but raised it must be if it’s going to look right. And spread a little sand and dust over those straight edges. Another little thing you might try. Not all of your layout has to be presented in the noonday sun. Mad dogs and Englishman and all that. I use streetlights wherever it makes sense and some of the important windows are alight. No all. 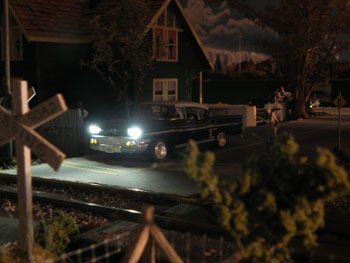 But the biggest impression that visitors have is the headlights, taillights and signals installed in my vehicles. It’s true that my stuff is bigger than most but that’s no issue today. 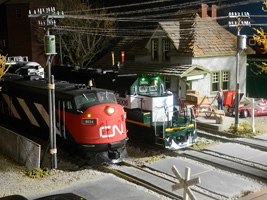 We have over 150 HO scale cars, trucks, busses and heavy equipment on our public display in the Peachland museum and all of them have correctly sized, properly coloured lights, front and rear. Emergency vehicles and police cars are easily spotted and workers carry safety lamps when working in the dark. I’d recommend you buy them buy the 100’s out of China. These are each about the size of a very small pinhead and they are still easily wired with leads. Even in my scale I use transformer wire. A little clear super glue holds them in place and also acts as a lens. construction project would have to start right there. I’m dropping this picture in here to demonstrate that there are many “transition periods” in the hobby. The steam vs. diesel doesn’t work for me. Nor does the CN/VIA era catch my fancy. 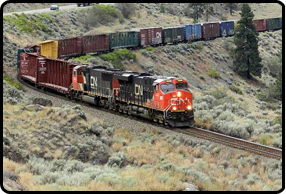 But I do like the mid seventies on the Canadian prairie branch lines when there were still boxcars moving grain. Some with roof walks and some without. More important, the Trudeau Hoppers were making their way across the West, all bright and new and shinny, attracting all the attention. Readers will remember that I made this aluminum Government of Canada 4 bay hopper myself but there are a number of modern hoppers out there. 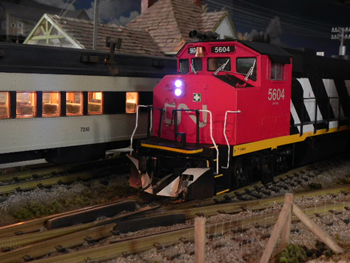 The best by far is the USA Trains 4-bay center flow hopper seen here…. 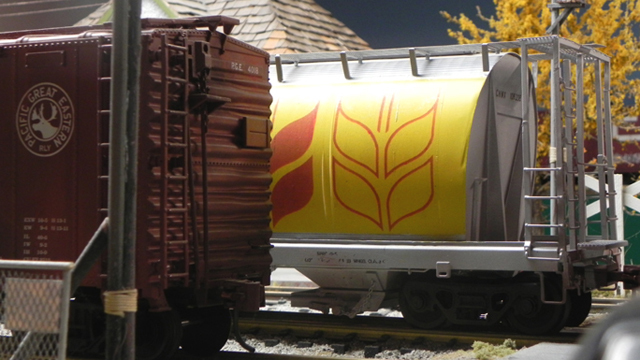 Of course in the popular scales you can find true Canadian style grain hoppers in the whole rainbow of great colour schemes. This lightweight version was the first one I ever saw and photographed. Grande Centre AB was loading two of these new fangled things as well as, if you can believe it, an old outside braced wood boxcar fitted with the last of the grain doors. 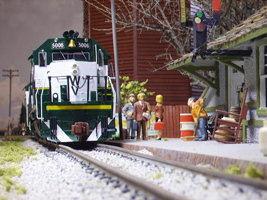 Now that’s getting the most out of your rolling stock. This picture is included to remind everyone, in any scale, that yards are mostly empty places. Or they should be. Or you need to replace your CEO. This small facility at Colder is 22 feet long and I can usually keep it down to three cars, maybe four, ether waiting to be picked up from the mine or just being dropped off. With two trains a day, one in each direction, why have more. At the same time, I do keep our snowplow up there during the worst winter months. It spends the summer in Grande Prairie where it can be maintained on and off during slow periods but I don’t subject the crews to pushing it up into the high country day after day from October to April. Minor maintenance issues they can fix up there. A couple of other familiar things in that picture. Apart from the trees and rocks. 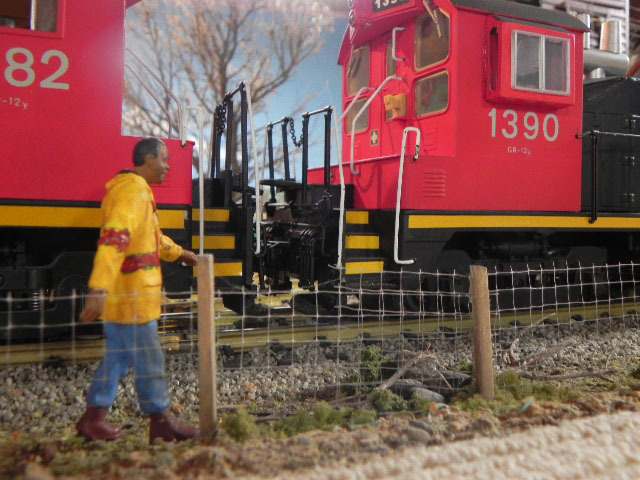 I know that power lines and telephone poles can be a serious pain on the layout but in truth, if your apt to count air hoses on noses, you’ll know you can’t have too many poles sticking up just where they get in the way the most. Anyway, give it a try. Your boring old yards will look great. Same yard – other end. My F7A/B is waiting over at Colder for WV 8106 West. The Winter Valley scheduled mixed freight is ‘unscheduled’ today and it’s still making it’s way up High Pass this late afternoon. 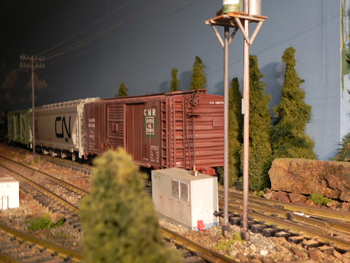 Perhaps another ½ hour and the leased CN pair will be heading on down the hill. 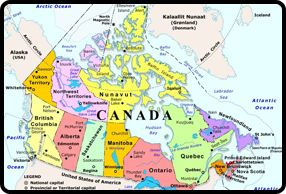 This is quite common from late August through late October as all the normal traffic; lumber, oil, ore as well as general merchandise gets bogged down with the grain harvest. A couple of things here: That tree that dominates the scene is Sage. Easily acquired in these parts just outside my door. This dead sample was exactly what I needed to represent dormant trees – at altitude. The rocks are real as well. Why fight nature. There is a mountainside not far up the road from me that is made of rust coloured rock and shale. Just the thing for a mine site. I used larger chunks to set the ‘place’ and I used naturally occurring dust and smaller pieces for ballast through the whole of Colder Yard. Just as the prototype and it really works. That’s another soapbox I often climb. If you can find natures dust and dirt use it. 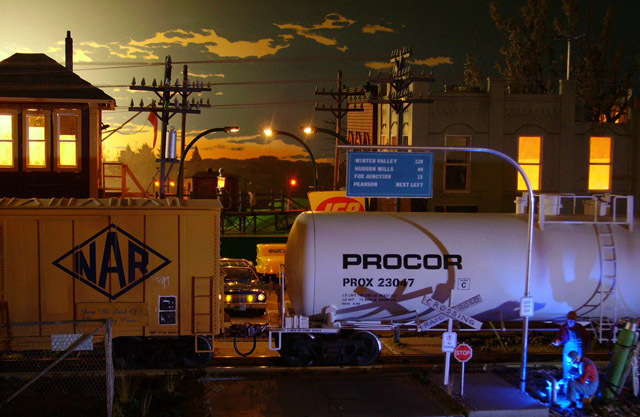 The model railroad product is vastly overpriced and it may not have the colours and texture you want anyway. Dust from the side of the road works well. Sift it very fine, run a magnet through it and store it in a glass jar. As many as you can – from everywhere you go. Oh yeah! And don’t look at that Christmas decoration from RONA. I have a Prototype Model Industries Safety Cab sitting in a box under the layout waiting a USAT SD40-2 that doesn’t cost an arm and a leg. I started off looking for a paint scheme that was easy to strip and repaint but lacking that I have broadened the search. Keeping an eye on Ebay of course and listening for someone getting out of the hobby. 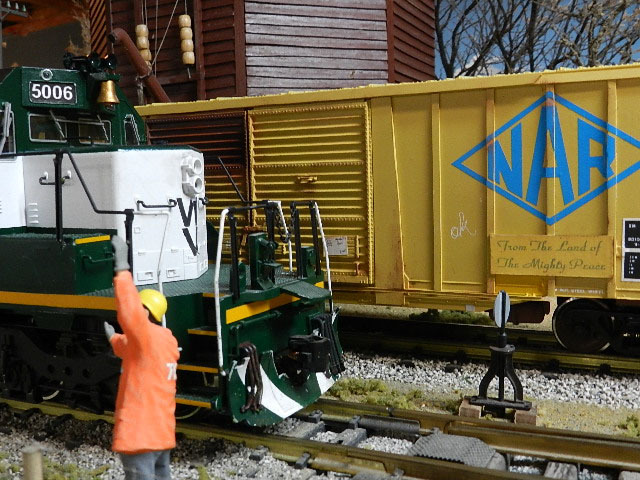 I really want to do up my CN favourate engine like the GP model below but of course without the hassle of building the cab from scratch. I can’t emphasize enough the need for correct scale drawings when you do take on a serious project like that. I had a local printer make me a complete set in 1/29th scale that were based on accurate HO drawings in RMC. There were copyright questions but he was soon convinced I wasn’t going sell them. Some printers can’t be convinced so you have to look around. That combine on the station track was a really great project for me and the first I attempted beyond simple boxcar modifications. There was a lot of cutting and moving of windows and doors on the Aristocraft car but all the numbers came out right – except for the length. Being rather unfamiliar with passenger equipment didn’t help my anxiety. The original 7210 hung out around Hearst ON during the mid 70’s shuttling the natives and visiting campers in and out of the bush between there, Armstrong and Sioux Lookout. Not to forget the Chosen Frozen of the RCAF. Two nice photos of her sisters can be found in CN Colour Guide Vol. 1. Deep background on this picture. I wrote the text three times and twice I deleted it accidentally. Perhaps that’s a sign. At any rate, these are my much-used SW1200’s and as you can see they really need new steps. I’ve a friend who built the correct Canadian steps; straight up, for the SD38-2 in his NAR so I know it can be done. The best time to do it would be when I take it all apart and install the new receiver/decoders. They will be the G3 type for both because the ‘drop-in’ is far down on their production plans. CVP confirmed today by email that my throttle would work with the G3 just the same as the drop-in. 3 of them will finish the WV fleet. Once again, things upcoming: I had an old Canadian National GP9 in green and yellow. It belonged to a friend and Korean War hero who passed away over a year ago. It had been badly gutted for installation of an odd slot car receiver device and walk around transmitter. Not by Ken but rather by a hobby shop in Salmon Arm. That old engine is in the midst of getting a new USAT motherboard and a low nose modification. In progress. Will report. I also have a USAT wide vision caboose getting a total make over so it becomes CN 79757 complete with all exterior lights and green/red markers. Again. A work in progress. So stay tuned.